Torquay Beach- explore the beaches of the English Riviera. Anstey's Cove. Around Hopes Nose from Torquay proper is this very sheltered cove with a shingle beach. Backed by sheer cliffs and wooded hillsides, only reachable on foot down a steep path. A popular cafe offers some superb views across the Bay delicious food and drinks, as well as ice cream and beach goods. The nearest car park is 1/2 mile away. The 180 foot high cliffs offer some of the best sport climbing in Britain. Meadfoot Beach, -delightful suntrap of a fine shingle beach. Behind which is the fine crescent of the Osborne Hotel. Torre Abbey Sands, Torquay. Only a short walk from the town centre. Across the main road from the beach is Torre Abbey Meadows, themselves a mecca for sun worshippers. A wide 600m long sweep of sand, with fine views across to the harbour and pier, all backed by a promenade. 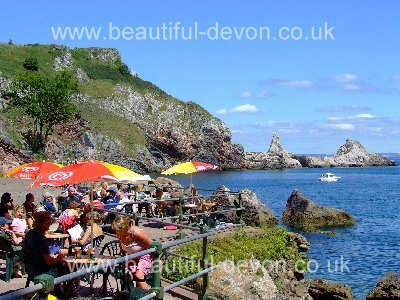 With some of the better Torquay hotels a short walk away making this a mecca for visitors. Particularly popular with families. Lifeguarded in season, with ramps providing disabled access. Café restaurant nearby. Those with a head for heights may care to experience the Hiflyer tethered balloon. At the northern end is Corbyn Head Beach, a mixture of sand and shingle. Smaller and less popular than its larger neighbour Torre Abbey, but offering the same delightful views across the bay. Backed by beach huts with brightly coloured doors. Toddlers and grown ups alike will enjoy exploring the rock pools. Follow the main road or coast path southwards and the next beach is Hollicombe Beach. 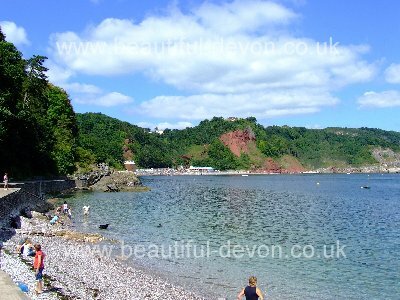 Backed by red sandstone cliffs, very off the beaten track, yet another real suntrap of a Torbay Beach. At the time of writing the beach is closed, due to a rockfall in 2009. The nearest car park is over a mile away so only for keen walkers if the beach is ever re-opened!!! Oddicombe Beach. Often confused with Babbacombe Beach. The latter being tucked under the cliffs is not visible from Babbacombe Downs. 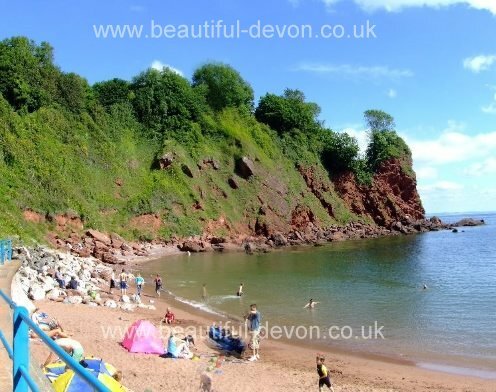 Oddicombe -a beach for all the family, one of the most popular Torquay Beaches. To reach it take the Cliff Railway. Gift shop, café, deck and sun bed chair hire. Dog ban in summer. Life guard attended in Season. With it's location, it's facilities and great views not unsurprisingly very popular. Lots of car parking near the Model Village. Babbacombe Beach. Walk west to Babbacombe Beach and Harbour. The beach itself is mainly shingle, and covered by the tide at high water. Maidencombe Beach. One of the many delightful slightly off the beaten track locations to be found and explored in Torbay. Only a couple of miles north of Torquay. Maidencombe is a village with thatched cottages and a popular pub- named of course the Thatched Tavern. Many of the buildings are so picturesque, their external appearance little changed over the last hundred years. Walk down a somewhat steep lane through the leafy valley to a small and secluded beach, backed by sandstone cliffs. There is a short flight of steps down onto the beach so access is only for the fit and able. The location is made all the the nicer by a beach café . It's deck offers one of the best views, not forgetting the cafe's mouth watering often home made food. Locally much of the South Devon Coast is in the care of the Torbay Coast and Countryside Service, including Maidencombe Farm. 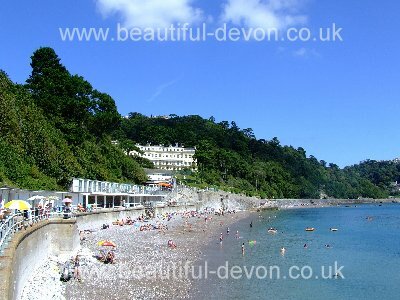 Want to go on a Devon walk, why not explore this beautiful stretch of coastline, around to Watcombe Beach? Watcombe Beach. Reachable by walking down a steep path with a short flight of steps just before a café. 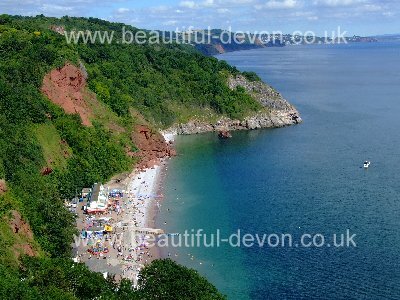 The beach itself, like nearby Maidencombe, is a mixture of sand and shingle back by red sandstone cliffs. Even in peak season the beach is unlikely to be crowded.